Kyle Busch is no stranger to success at Martinsville Speedway in the NASCAR Gander Outdoors Truck Series, and the winningest driver in series history added to that record on Saturday with a win in the TruNorth Global 250. 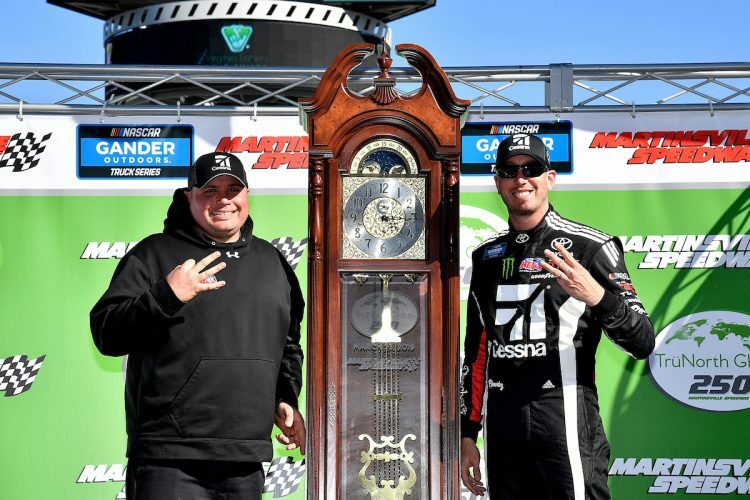 Busch said that, after claiming the first 75-lap stage victory, it was a matter of staying patient during the middle portion of the race and allowing his team’s tire strategy to play out. Once Busch re-took the lead in the final stage, it was just a matter of surviving a loose condition and some late-race restarts on the way to his second Truck Series victory at Martinsville Speedway. Busch led four times for 174 laps en route to the victory. Ben Rhodes, Brett Moffitt, Ross Chastain and Stewart Friesen followed Busch home to round out the top-five finishers in the TruNorth Global 250. As for the famous grandfather clock trophy, Busch said it was crew chief Rudy Fugle’s to keep. Following Busch’s TruNorth Global 250 win, the Monster Energy NASCAR Cup Series drivers hit the track for Virginia Lottery Pole Qualifying ahead of Sunday’s STP 500. Logano posted a 97.830 mph lap in the final round of knockout qualifying to claim the top spot, edging fellow Ford driver Aric Almirola. Logano’s fifth pole award at Martinsville Speedway comes in his 21st career Cup Series race weekend at the historic half-mile. Almirola, Brad Keselowski, Kevin Harvick and William Byron round out the top-six starting spots, and will lead the field to the green flag from the first three rows. Chase Elliott, the fastest car in STP 500 final practice, will start eighth in Sunday’s race. The STP 500 will be run Sunday at 2 p.m. and tickets are still available. Adult tickets start at $47 and can be purchased by calling 877.RACE.TIX or online at www.martinsvillespeedway.com. Youth tickets for the STP 500 are $25 at any location in the grandstands.